It certainly seems a long time ago that he made his debut for the Clarets, as a substitute in a 1-0 defeat at Lincoln in Division Four. 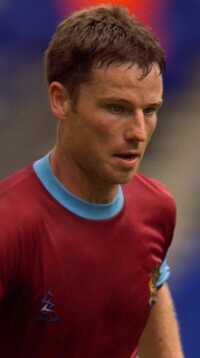 He had arrived from Southampton on loan and the Clarets were also fielding another debutant in striker Ron Futcher. The line up was: Chris Pearce, Ian Measham, Jason Hardy, Andy Farrell, Shaun McGrory, Tony Hancock (Peter Mumby), Winston White, Ron Futcher, Brendan O’Connell, Joe Jakub, Paul Atkinson (Steve M Davis). The reason for showing the middle initial M is because the Clarets’ captain at the time was Steve P Davis, out injured that day, and the following week the two of them formed the centre of our defence. He impressed but after nine league appearances he returned to Southampton and that, we thought, was that. Steve P Davis (Mark I) was paired the following season with new signing John Pender and Steve M Davis (Mark II) was never given another thought. We reached the Fourth Division play offs but failed to win promotion and Steve Davis (Mark I) chose to end his association with the club and moved on to Barnsley, then two divisions higher. Right on the eve of the new season manager Frank Casper signed the forgotten Steve Davis (Mark II) for £60,000 and he came straight into the first team. He signed at just the right time because in his first season we stormed through to the Championship after a shaky start had seen Casper leave to be replaced by his assistant Jimmy Mullen. Clubs have good times and bad times and this was a good time for Burnley. Davis had become a vital member of the side that finally saw us out of the bottom division and he continued to impress over the next two seasons in the new Division Two culminating in the play off win at Wembley in 1994. It is fair to say that by this time he had become one of the most popular players in the side, probably alongside David Eyres the most popular, and it was unthinkable to think of us without him in the side. With Jimmy Mullen replacing John Pender with Mark Winstanley the captaincy passed to Davis and everything was looking good for the North Easterner. But just as things are going well they can take a downturn and after holding our own for half a season in Division One disaster struck with eight successive defeats from which we never really recovered. Relegation followed and despite being offered a new contract he turned it down and surprised everyone by signing for Luton Town. Many had expected him to go to a bigger club and it was something of a shock that he chose Luton even though we had left them a division above us. 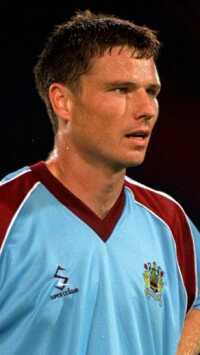 The tribunal had to set the fee and we received £750,000 for him and that remains a record to this day for the Clarets. Having suffered that relegation with Burnley in 1995 he suffered the same fate a year after when his new club Luton went down and that meant games against the Clarets again in 1996/97 with his former club now under the management of Adrian Heath. It was towards the end of the season when the home game came against Luton with both clubs still harbouring hopes of a promotion. 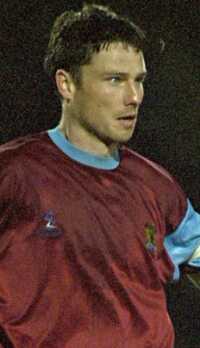 The former Burnley captain led Luton out and received the most incredible reception from the Turf Moor crowd. If he had ever been in doubt just how much the Burnley fans thought of him they were quickly dispelled and the Luton fans looked absolutely stunned. They beat us 2-0 with two goals from Tony Thorpe but that made no difference in the following season when the reception was just as good if not better. Times were getting tougher for Burnley, a near relegation back to the bottom division under Waddle and things not a lot better in the following season with new manager Stan Ternent in charge. We’d been humiliated in the cup against Darlington and were struggling too close to the bottom of the league again. We had just failed to beat bottom club Lincoln at home and were facing the New Year with another major struggle to stay in the division. Then news broke that we had made a signing, not only made a signing but smashed our transfer record (£350,000 paid for Paul Barnes). Nobody knew who it was initially because nobody was prepared to pay the Frank Teasdale premium rate for the news. If you could have polled the fans and asked them who they would have liked to sign then I’m sure Steve Davis would have been the first name. His signing was a real statement of intent from the new Chairman elect Barry Kilby. Graham Branch was signed before the next match and both made their debuts at home to Walsall. But it was Davis the crowd wanted to see and the reception he received as he came out was amazing. It was like the prodigal son coming home and seeing him back in a Claret & Blue shirt somehow just looked right. Stan realised his importance and he was soon captaining the side and such was his influence that he continued to play even though, he was in need of a hernia operation, until safety was assured. The next two seasons were pure fantasy for the Clarets and took Davis himself to new heights. Promotion was won under his captaincy in 2000 and then he took us on a new style Division One adventure, one where we didn’t just survive in the division but only just missed out on the play offs. Promotion would have seen him become only the third player to play for Burnley in all four divisions, Billy Rodaway and Joe Jakub have achieved that. Undeterred the Clarets set off like a house on fire the following season and everything seemed to be going well. He led the side to a point in a superb comeback at Gillingham in trying circumstances on 30th October 2001 but when we lined up against Sheffield United on the Turf four days later he was not in the line up. Stan explained his absence after the game saying, "Steve Davis had a little strain on the side of his knee so he couldn't play but it is not too serious and he should be okay for the weekend." In fact Steve’s injury was far more serious and it was months before he played again. Even when he returned there were more injuries that kept him out of the side and that continued into this season. He won his place back in the side again but looked to be struggling and another injury in the 6-2 disaster against Rotherham (he scored both goals) saw him on the sidelines again for a lengthy period. Having been out for three months he was a surprise inclusion on the bench for the cup tie at Watford, coming on for Paul Cook. He was very much at fault with the crucial first goal and although he has played in every game since, his longest run in the first team for some while, he has looked a shadow of the Davis of old. With Stan admitting that he would be rebuilding and rebuilding with a younger squad it came as no real surprise that he was released at the end of his contract when Stan announced his retained list. His recent performances don’t do him justice but it won’t be these performances that the Burnley fans will recall in weeks, months and years to come. There will be so many good performances, so many match winning performances that we will remember. There are three promotions for starters in 1992, 1994 and 2000, he was captain for the third, some great cup days against the likes of Derby and Spurs. Only eight post war Clarets have played more games for the club. Five of those come from the 1960 Championship side – Jimmy Adamson, John Angus, Tommy Cummings, Jimmy McIlroy and Brian Miller – and the other three from the 1973 2nd Division Championship side – Martin Dobson, Alan Stevenson and Colin Waldron. And during this period there is no doubt that no defender has scored more goals. He is in some top company there, and deserves to be, but just like the others the time comes to leave. This is the third time Steve has left the club and this will be the last time. He will go safe in the knowledge that over the years he has been a Claret he has left us with so many good memories.